Not less important is the question: Does GERB have such a candidate at all? What do the presidential elections mean for GERB? It might appear an elementary question, but that’s only a first impression. After 2013, nothing is the same. Every political move since then has proved that. The Borisov 2.9 government is only a formal successor to Borisov 1.0. It’s not the improved version we were hoping for. No-one can doubt GERB’s triumphant return to power as the leading political force in the most recent history of Bulgaria by winning the second general elections in a row. It is the first “right wing” political party to survive the biggest political crisis in recent Bulgarian history with a “hard” electorate. Peevski’s gone – So I can make reforms Yes, but not really. Borisov flunked his historical opportunity to begin changing the country, even after 404 days of civil protests on the streets of Bulgaria insisted on reforms. Yes, he did form a coalition government, but not in the aims of consensus for reforms, but just the opposite. He demonstrated astonishing flexibility in the creation of new, often covert, coalitions, just so that the reforms wouldn’t happen. We have a government of the status quo; the worst possible version of the status quo and its best form. This time, however, it can’t be hidden. Because the process of decay which is killing the country can only be guaranteed by people like Peevski, but he is a consequence and not the reason. The sickness was mercilessly defined during the Protests – #WHO No-one ever called this process: #Tsatarov, #Vasilev, #Peevski. The #WHO model is the same as the #Status Quo model. Everyone who took part and colluded in the process are part of the status quo. It is no longer the best kept secret. 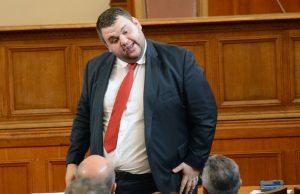 The “Media Empire” of his ally from the first Borisov government, Delyan Peevski, collapsed under the weight of his own inadequacy. This was one of the greatest achievements of the 2013-2014 Protest. The complete subjugation of national television companies whose survival depends directly on state subsidies for one of them – Bulgarian National Television, and European funds for all three BNT, bTV and NOVA. However, it is not enough. Quite often their desire to be of service, is in fact injurious to the Prime Minister. 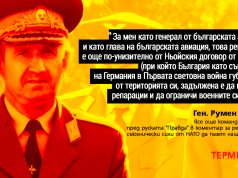 In the words of a high-ranking foreign diplomat, “Borisov thinks that what he says hear is heard only in Bulgaria, but they listen to him very intently abroad as well”. So the television companies have, willingly or not, become conduits of something which sounds frightening outside the #Territory. 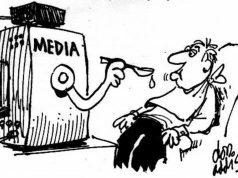 Despite all efforts, “the situation we have” on the one hand is acutely reflected in the merciless mirror of the foreign media. On the other hand, there’s no way our European partners are going to let it be swept under the carpet. On a third hand, a significant section of the Bulgarian people who have always reacted sensitivity to attempts to undermine the democratic principles in the country by oligarchical dependencies, have come to the fore as leaders of opinion through the freedom of the social networks and the few remaining critical media. Let us deviate slightly from the theme. The removal of Chavdar Nikolov’s caricatures and other of his publicist articles from the media and video platforms connected with NOVA television is absolute proof of the fact that nothing is or can be the same. However, this is clearly underestimated by all the key players in the Borisov 1.0 model. Whether this is a case of censorship or auto-censorship, the trampling of the freedom of speech is just one more of those sins, in the long list starting with Peevski being announced as head of the State Agency for National Security. This is not something which can be ignored in the quiet whimpering of our closed environment. The public reaction to the removal of the caricatures was more than eloquent. Then Bulgaria woke up one morning bottle of the EU freedom of speech rankings. GERB is united and strong. There is no discord between the leading figures, despite appearances to the contrary. The situation is: ”if there is anything, it doesn’t really matter”. Tsvetanov and Bachvarova are OK, Tsvetanov and Borisov are too. Nothing was said about Tsvetanov and Moskov. Daritkova was quoted. If there is anyone in Moskov’s position, he should be worried. GERB can be removed from power only by GERB Those of us with a longer memory began to ask ourselves: Did GERB remove themselves from office in 2013? Then another question comes to mind: Has GERB been infected with the same syndrome as the BSP in 1997, when they promised that they would never allow a few thousand people on the streets to remove them from office. Didn’t that lead to the longest daily protest movement, perhaps in world history? Last but not least, Borisov spoke about the Presidential institution. He made it clear that GERB expects its elected president to remain loyal, because GERB spent money on his campaign and election. So, a number of things came clearly to light: GERB has a problem with the Bulgarian Constitution, since it is the Constitution which guarantees that the Head of State stands above party politics. GERB wants to have complete unanimity in the institutions which its controls and uses. When such words are uttered by the leader of GERB, who is also the Prime Minister, they can only have one interpretation: Boiko Borisov wants an obedient President. This takes us back to an interview which he once gave to the morning show on BNT, when he was still chief secretary of the Ministry of the Interior. He said he wanted Bulgaria to be a presidential republic. He’s clearly attracted by the idea of unanimity. We can’t help but make comparisons with Orban. What we are clearly witness to is the “remnants of the communist state security services” clearly and persistently working on the “Boiko-Orban” scenario in Bulgaria. They are aggressively imposing this idea in all possible ways. Let’s look at what Borisov said at the party forum on Sunday. “We are soon going to have presidential elections, and the interest is more and more focused in that direction. I can’t understand why the political parties are asking us who we’re going to put forward as president, since when we choose him, and we’re paying for him with our political subsidies and our structures, the very next day he will be obliged to distance himself from us. So why should we bother proposing a president? The very first day, he’ll have to say: “I’m distancing myself from the people who put me here”. I don’t see the logic in that. A different way has to be found to elect the president. Otherwise why should we bother supporting someone to become president, only for him to distance himself from us”. His first interim government adopted the Decree on the money held by commercial companies in banks. This led to the removal of state money from KTB bank which had reached a level of concentration of 54% – under the care of all, I repeat all, the governments of the status quo. His key role as advocate for profound judicial reform. Hristo Ivanov took up his post as Minister of Justice and declared reform to be his main priority in Plevneliev’s second interim government. The most categorical element which Bulgarian President Plevneliev has maintained throughout his mandate, albeit largely uncomprehended by the general public, is foreign policy. This is something which clearly confirms his connection to the democratic world. He has become a major proponent of pro-Western policies, not only for Bulgaria, but for countries in a similar position to ours. A few days ago Plevneliev was declared Personality of the Year in the Ukraine, due to his opposition to the imperialistic ambitions of Putin. This is not a question. It is a conclusion. However, let us first look at the possible GERB presidential candidates. This will allow us to dwell on an indisputable fact: GERB is the only “right wing” political party in the recent history of Bulgaria with a “hard” electorate which guaranteed victory at the elections. The question is, however, whether this hard electorate is sufficient to provide GERB with victory at the presidential elections? That is right. But not exactly. At all the elections which GERB has won, it has always managed to gather about one million votes. However, to win the presidential elections, any political party will have to gather about one million and seven hundred thousand votes. This immediately removes any party political candidate from a narrow political context. This is the thorn in Boiko Borisov’s heel. He wants to have a political independent candidate, but he cannot rely on any of his trusted party colleagues, since as he once said about Tsvetanov himself in a recent television interview, “#WHO’s going to vote for him?” This same statement can be said of all the potential candidates who have a solid party profile. It doesn’t matter whether we’re talking about Iordanka Fandakova, Tomislav Donchev or Dimitar Nikolov (each of them viewed as a potentially serious candidate, according to Terminal 3 sources). Their electability is a matter for the hard electorate of GERB which is no more than one million. Many analysts have always claimed that the MRF (Movement for Rights and Freedoms) plays a key role in these elections. The MRF have the additional votes required for a second round victory. However, after the recent processes which have taken place in the MRF, and the creation of DOST, things are not quite so clear cut. A number of sociological studies have suggested that between one third and one quarter of MRF voters have moved towards DOST, but this is based on data available only for Bulgaria. There is a huge question mark about the potential electorate in Turkey and their choice between the two parties. In other words, there is little certainty here either. It would be logical at a moment like this for GERB to look for rapprochement with the socialist electorate. This would lead to the need for either a covert or overt coalition to support their possible candidate. This, however, entails many stumbling blocks. An overt coalition between ABV, BSP and MRF (whatever the configuration) would antagonise the disillusioned classical right wing voter outside the hard electorate of GERB. However, a similar covert coalition would strengthen the impression that GERB is engaged in cloak and dagger politics through a series of tainted deals, just to keep itself in power at any cost. Given this scenario, GERB has certain clear options. Believe it or not, Kalfin was the preferred choice even for the first presidential campaign. We even witnessed a handful of gaffs by Tsvetanov, the head of the election staff, which almost sabotaged their own candidate. Kalfin today is the “favourite” deputy Prime Minister who has never been criticised in public for any reason neither by Borisov nor Tsvetanov. Quite the contrary, in fact. In other words, his presidential campaign began long ago. We also see that the “King”, as he is commonly referred to, is also campaigning in his own way. For something at least. Repeating verbatim the rhetoric of his return to politics in Bulgaria at the beginning of the century, Simeon Saxe Coburg Gotha gathered the newly constituted “Millennium” club of young Bulgarians studying and working abroad. Most of them are fervent supporters of Irina Bokova’s candidature for the post of UN GENSEC. He then went to the BSP forum and said that the BSP needed to have a presidential candidate who could win votes outside their hard electorate. Then he mustered the founding members and main activists from the NMSS, where they announced directly that he was the most suitable presidential candidate for a wide coalition between BSP, GERB and the MRF. Whether it was coincidental or not, that same day Parvanov made the statement that the parties who supported this government needed to have their own candidate for president. Looking at the situation from his viewpoint, he appears to have backed more than one horse in this competition, and is thus in a win-win situation. We shouldn’t forget Irina Bokova who seems to be prepared to be a candidate herself, as long as there is someone to propose her. It’s another matter whether anyone would vote for her. Nevertheless, we can interpret support for her proposal for the UN GENSEC post as a trial run for the half-covert, half-overt coalition between GERB, BSP and the MRF, but without the support of ABV. This would measure the temperature of public support. Borisov clearly is not counting on her being elected, otherwise he wouldn’t maintain that her nomination was a continuation of Oresharski’s policies. He wouldn’t miss out on the chance of beating himself on the breast and boasting that his government had proposed an elected leader of the UN. Terminal 3 sources are categorical that he has received assurances from the USA and the UK, that they would veto her candidacy. Why would she be nominated then, if it wasn’t as a dress rehearsal for another performance? The problem remains whether GERB can afford to love the most important elections – the elections for the president? What might really happen if GERB does not stand behind its own candidate, who would not restrict support to the hard electorate, but does the opposite and opens up the fan. There is another no less important question: does GERB have such a candidate? Yes, Rosen Plevneliev is undoubtedly one of the few with such a profile, even if only because he has already won once. He enjoys the unprecedented support of all Bulgaria’s partners in the EU and NATO, who see him as not just as GERB’s possible but mandatory presidential candidate. This was the primary motive for the visit by US Deputy State Department Secretary, Victor Newland’s recent visit to Bulgaria, according to reliable Terminal 3 sources. It is also a primary reason for the forthcoming visit by Joachim Gauck, the German Vice President. Apart from the question of whether GERB want to nominate Rosen Plevneliev for a second term, we are also at risk of ignoring another question of equal important. Does Rosen Plevneliev want to be nominated for a second term. Last September at an informal meeting of EU ambassadors, President Plevneliev clearly said that had objective and quite justifiable reasons not to propose his candidature. We know from a participant in this meeting that the President confirmed that all the political leaders in the country had been informed, as well as the heads of state of our western partners. In this context, Boiko Borisov’s claim that he wants a presidential institution which is dependent on the will of the party, hardly helps to change the position. It has to be seen, however, whether Borisov’s position will close the doors to the nomination of another candidate, whose profile is similar to that of Rosen Plevneliev: someone with a categorical and hard pro-western orientation with regard to foreign policy and an advocate of domestic political reforms. 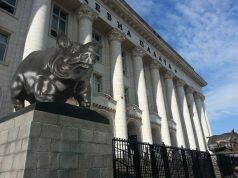 Would what that mean for the political processes in Bulgaria? What would it mean for Borisov to have a candidate like that – to appoint not an “obedient” political poodle but a worth politician with a vision to act as a balance. Does he really want that? What would it mean for Bulgaria, if GERB had such a candidate? After the almost complete assimilation of the Reform Block which we have seen this year, the country and its citizens, above all, will be deprived of the last possible institutional balance of power which they have had in key moments in the figure of the presidential institution. Perhaps this is good news for GERB who want unequivocal government at all levels of the state. This was been made clear by Borisov at a meeting of party activists on Sunday. However, in the long term, this is bad news for the democratic processes in the country. With regard to any obstacle put in the way of the democratic processes, neither Europe nor the USA will remain indifferent. As far as the citizens are concerned, no-one can be sure of their reaction to yet another political deception. Any sensible person would consider that the biggest, ruling party would see it as in their own interest to find and propose a candidate who would go beyond the narrow party profile created by Tsvetan Tsvetanov and Boiko Borisov. First of all, they would come out of yet another round of elections as the biggest victor. This would also confirm their positions amongst their hard electorate from a domestic political point of view. From a foreign policy point of view, this would guarantee their continuity in terms of retaining the democratic course, strengthening the processes and retaining a strong connection with that part of the world to which Bulgaria truly belongs – Europe. However, whether GERB are capable of seeing the evident benefit for them and for Bulgaria in finding and convincing such a candidate, and then getting him or her elected, is another matter. We have reason to have our doubts, since we know the “scale” or “what we have like Tsvetanov”. In order to have such a candidate, GERB need to skip over this evolutionary link in their political growth and stop going backwards. They need to move forwards at least. They need to make a leap of quality: from narrow party petty interest to a large scale state vision subordinated to the long-term development of Bulgaria in the right direction. Only then will we believe that Boiko Borisov has managed to emancipate himself from his own party apparatchik.